Posted on April 6, 2011 by Michael T.
I figured out that I really wanted my blog to not look like a blog. Does that make sense? I did not want a really, really long page with posts, but I also didn’t want to manually create a page, a snippet preview post, and a link for that post. My instructor said that he thought there were themes that would do what I was looking for. What does all that mean? I found it all in the “Duster” template. Make the front page a static page so there won’t be a long page of posts when the user first comes on the blog. 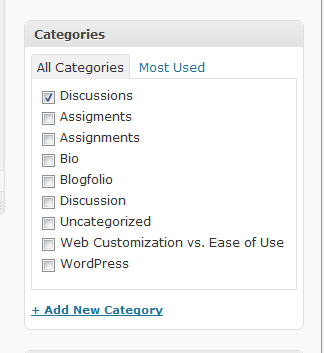 The categories will be how your posts will be divided up so make sure that you only have a few categories. My picture shows that I have many different categories because some were for testing purposes and others were misspelled, but notice that I only have 1 category checked for this post. This will place this post on the discussions page. If I had assignments checked it would be placed on the assignments page. The last thing I did was create my custom menu. This menu will display only the things that I define, which in this case will be my category titles. If you have any problems or if you see that I’ve made a mistake up above or have a better idea, please leave a comment! This entry was posted in Random and tagged blog, Duster, layout, theme, Wordpress customization by Michael T.. Bookmark the permalink. This is so awesome Michael and thank you for sharing how you did this. 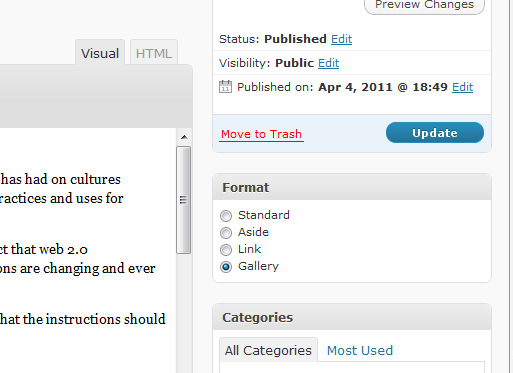 I love the navigation structure of your Blogfolio. Great Job.